It has been all but forgotten now, but when the late De La Salle Lipa President Br. Rafael Donato began implementing his comprehensive campus development project in the latter half of 1995, unexpected discoveries were made buried underneath the ground. The SENTRUM, the multi-purpose gymnasium visible from the highway, was well on its way to completion late in 1995 when a bulldozer started digging up earth right next to it so that the foundations for what would become the administration building, later named the Jose. W. Diokno Building, could be laid. The construction crew would soon hit a snag. As the bulldozer dug up earth, several World War II vintage bombs were discovered buried underneath the construction site. The entire five-hectare lot upon which the campus development project was being implemented used to be a coconut grove. Obviously the bombs must have been covered with earth after the war and completely forgotten until the construction of the administration building began. Students of DLSL in the sixties and seventies, including this writer, used to hear stories that the entire campus used to be a Japanese army base during World War II. In fact, there used to be this large concrete slab right smack in the middle of the football field which people conjectured could be anything from having been part of a road or runway or even a Japanese bunker or tunnel that had been covered up. That the campus was, indeed, a Japanese base is something that I have been unable to verify. The Diokno Building of DLSL, where vintage bombs were excavated during its construction. The point of all these is that my initial thoughts upon hearing about the excavated bombs was that these were probably Japanese weapons stashed away in an underground armory. Instead, the bombs were American-made. The bombs might have been corroded, but the markings on some were still very visible. Many more bombs would be excavated in front of the Diokno Building when construction was started in less than a year for the school’s laboratory hotel, later to be named Chez Rafael after the school’s former President. Again, these were all American-made. In November 1944, Allied forces under the command of General Douglas MacArthur had begun launching air raids upon select locations in Luzon to soften Japanese defenses for eventual liberation. Lipa was a particular target not just because of the presence of sizable Japanese troops but also because what is now Fernando Air Base used to be a Japanese airfield. In fact, the entire town center of Lipa was reduced practically to rubble by frequent raids by Hellcat, Helldiver and Avenger aircraft launched from the aircraft carrier USS Hancock.2 The bombs found at the construction sites of the Diokno Building and the Chez Rafael were likely from these aircraft. The bombs found at DLSL were by no means unique in Batangas. In 2004, 108 World War II-vintage bombs were discovered in Cuenca.4 This was hardly surprising because some of the fiercest fighting in the Pacific Theater of War in 1945 were the battles at Mt. Maculot, which was heavily defended by the Japanese. 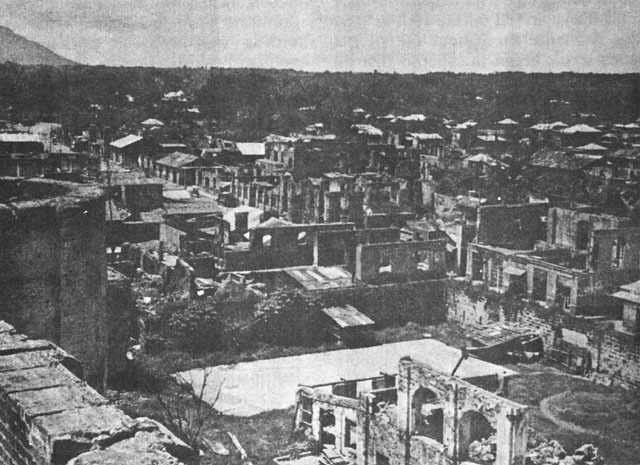 The town of Cuenca itself was badly destroyed. In 2008, at least 150 vintage bombs were discovered at Barangay Sta. Maria Itaas in Bauan. The bombs were discovered accidentally by a resident who was digging a hole in the ground to use as a garbage dump.5 It is not clear from online reports if the bombs were of American or Japanese make. A 5000-pound bomb was found at the FPIP Industrial Park in 2016. Image credit: Tanauan City's Hope. In 2012, twenty-six vintage bombs were found at a construction site at Barangay Sta. Ana in Sto. Tomas. These were taken to the local police and one bomb had to be detonated after it started releasing smoke.7 As recently as February 2016, a 5000-pound vintage bomb was found by construction workers at the First Philippine Industrial Park, which spans both Sto. Tomas and Tanauan. Both Tanauan and Sto. Tomas were heavily defended by the Fuji Forces to prevent the Americans from advancing south in 1945 from Tagaytay through Talisay and also from Los Baños in Laguna. The two towns were heavily pounded by the Americans using artillery and fighter planes. Back in Lipa, in 2013, 140 vintage bombs were excavated inside the grounds of the Amiya Rosa Subdivision by a bulldozer operator. The bombs were safely removed by Air Force personnel based at nearby Fernando Air Base. These are just the incidents that made the news, and mostly because of the number of bombs found each time. There have been many more which had not made the news. It is almost a certainty that there are many more still undiscovered, lying underground just waiting for the next bulldozer to come along. Decades later, some of these bombs continue to be very dangerous. 3 “Relax, Finding Gigantic Undetonated Bombs from WWII Is Totally Normal,” by Alexander Abad-Santos, online at The Atlantic. 4 “108 vintage bombs, nahukay sa Batangas,” online at Life is What You Make It. 5 “World War II-era bombs discovered in Bauan, Batangas,” by Tina Ganzon, online at ABS-CBN News. 6 “US Army in World War II, The War in the Pacific, Triumph in the Philippines” by Robert Ross Smith, published in 1993 by the Office of the Chief of Military History, Department of the Army, Washington D.C.
7 “26 WWII-era bombs unearthed in Batangas,” by Angelique Atienza, online at ABS-CBN News.